GeoPicker property is based on Google Maps API and provides a rich interface for selecting a geo-coordinates – perfect for editing location of points of interests we want to show on a map. To use the property set the type of the property to GeoPoint. Property editor lets editors type the geo-coordinates in Lat/Long number inputs or click on the location thumbnail to display a richer UI. The popup lets editors search for locations and/or select a point by dragging a marker over the map. 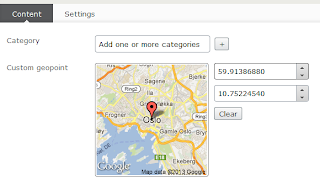 After the location is selected, property editor shows a thumbnail of the location and its geo-coordinates. I don't seem to make it work. 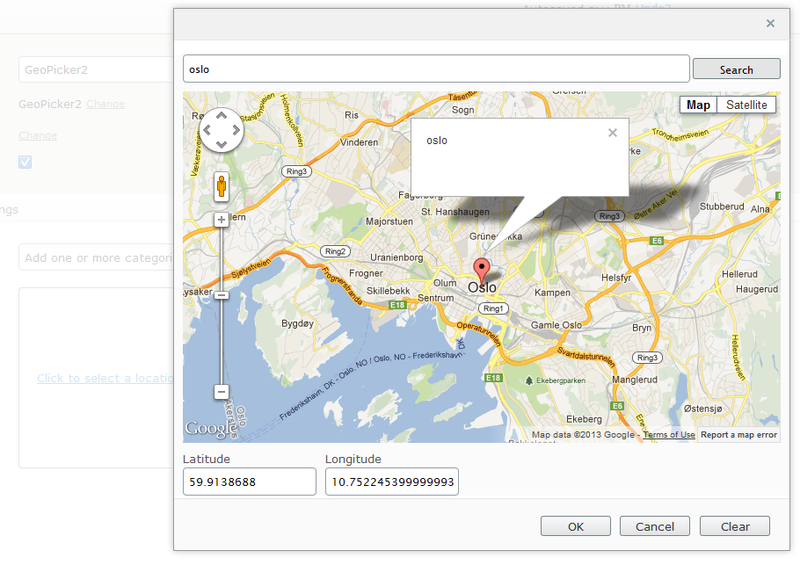 The Google Maps window pops up but whenever i click the map the lat/lng fields don't get their values. The address field gets the correct info though. Do you have a solution to my problem? Hello, I seem to have the same problem. I'm running EPiServer 7 MVC with patch 1. Installed the geo point picker via nuget. The Long and Lat properties does not get any value, except "undefined" in the map pop-up. I am experiencing the same problem as Thomas F.
Please check newest version (1.0.85.478) from nuget. Should work fine now. I have tried using it and have two questions. 2. How do I retrieve yhe geo point in my template? It's just the static map in edit mode where I pick my geo point that will not render. Is there anyway to change the default zoom level in edit mode. It's set to 19. Maybe that's why the static map image will not render. Have any idea why there is only a static icon in the map area after have picked a location. Lat/Lng is saved but there is no map. 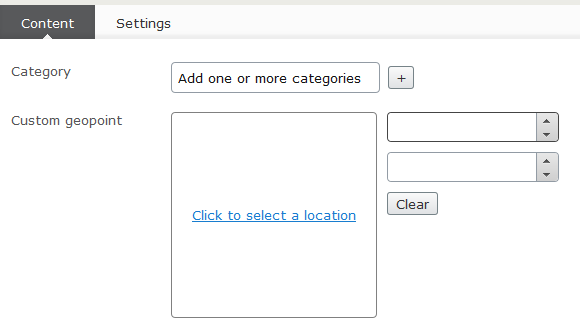 When you select location in EPiServe redit mode zoom is also saved. 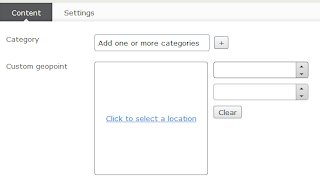 So it means that map is displayed in same zoom as when you selected location. Thanks for supporting me in this. I think the control is beutiful. My problem is not in view mode. Is it possible that edit mode uses different url (host name) than view mode? Does firebug show any error in console? I have tested this on fresh EPiServer 7 environment and it seems to work in edit mode. Is this tested with the latest EPiServer? I get "undefined" in the latitude and longitude textboxes. I had to modify the source because the ClientEditingClass has changed from using "." to "/" as delimiters in the latest Epi release. I'm thinking maybe more have changed..
Hi! This property would be perfect for me but I can't get it to work. Probably due to EPiServer updates. When attempting to go into edit-mode on a page with the property on it wont load: 404 - can't find GeoPointSelector.js or GeoViewPortSelector.js. Any solution? package in NuGet Gallery. Please update/reinstall package and check the newest version. I have installed the latest nuget-package on the latest episerver version. I get this script error in edit mode and I can't edit the page. SCRIPT5022: declare ow-epi-geoProperties.widgets.GeoPointSelector: mixin #5 is not a callable constructor. in my code I can't go to Edit view.. any ideas? i can't view the form editing for that page. any ideas? in your templates? I get the error, "object reference not set to an instance of an object." I have the latest versions installed as I just installed them today..
Beth, Which EPiServer version (and patch) do you use? I did have EpiServer-Platfrom 1.0.9001, Add-On Store UI 1.0.1092, EPiserver Edit UI 1.0.431, and UI Platform 1.0.456. Do you have any ideas/suggestions for me? Will there be a 7.5 update to the Geo Point Picker soon? Will there be any updates to the Geo Point Picker for the EpiServer 7.5 any time soon? We are upgrading our website from 7 to 7.5 and the release date is end of february. I would be good to know if I need to find another solution or if I can wait for the upgrade. i'm new to this and i'm not too sure where i should place the PropertyGeoPoint.cs file in my folders? Hello I had tried that but for some reason (i tihnk it's due to working on episerver 7.5 ) but it wouldn't work correctly so at the moment I am doing it by hand. so in what folder should i place these files? 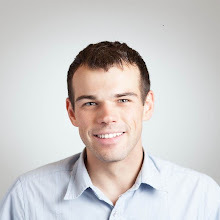 such as GeoPointSelector.js and/or how do i rewrite the path to the correct file? Source code is available on Codeplex.